Water simply shouldn’t be pouring down from your ceiling. And leaks simply shouldn’t turn your walls into waterfalls. A plumbing leak within the structure of your home can be downright dangerous. Over time, these leaks will damage the structural integrity of your walls and ceilings. On top of that, unattended leaks can lead to mold growth; and that mold can be harmful to you and yours. Don’t let a ceiling or wall leak go unattended. Even a slow leak can wreak havoc on your home. Give us a call to have a plumbing tech seek out and fix the source of your leak. Take note, we also provide emergency plumbing services! 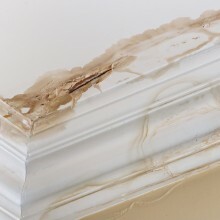 It can be difficult to find the source of a leak within your wall and ceiling structures. Since water can flow across the surface of your ceiling and pool in one place, the place where the problem is notable may not be the place where the leak has formed. Fortunately, we’re experts at identifying and fixing problem leaks. Though we may have to tear into a wall or ceiling to identify a leak and perform a repair, you’ll save more money with a fix than leaving the problem unattended. We also strive to be as noninvasive as possible when we have to cut into a wall structure or a ceiling. If you have a leak that’s an emergency, you can call on us! InSink provides 24 hour plumbing services in the case of emergencies – all at no extra charge to you! Please, give us a call as soon as you note a problem; and if you can locate the shutoff valve for the source of a leak – by all means shut it off!